This blog post is definitely more personal and probably less relevant. But I was enjoying reminiscing of a time many years ago now. Thanks for indulging me. Just to be clear right away … I never played in the basketball state tournament. For those of you who know me, I am short and slow. I play a mean game of H-O-R-S-E, but other than some jv ball, that is as far as my skills have ever taken me. But because of years of watching, I do know the game of basketball and that started when I sat on the bench in high school. You see, after helping take stats when I was a sophomore, I learned I enjoyed watching the game with a critical eye. So, the next two years, I did not play but instead managed and become team statistician. I can still do many percentages in my head because of that time. Being a part of the Lincoln Christian team was a wonderful experience. While I may not have been on the court, my friends were, and I definitely felt a part of the experience. Thanks to the excellent online records over at Nebraska School Activities Association, I could verify that our girls team was at state every year that I was in high school. Mainly we seemed to always get stopped at Pershing – that was always an odd place to have a game as the court felt like an island. The closest we came to a championship during that season was an unexpected runner-up my freshman year. State tournament time was filled with team togetherness, meals made by moms and school spirit. One year when we lost first round, I recall going to watch other games as a team (after all, we had the passes!) The camaraderie from that season of life will always be a special memory. Fast forward to the game picture I featured on Wednesday. First of all, thanks to Jill and to Susie for getting the pictures/article for me. 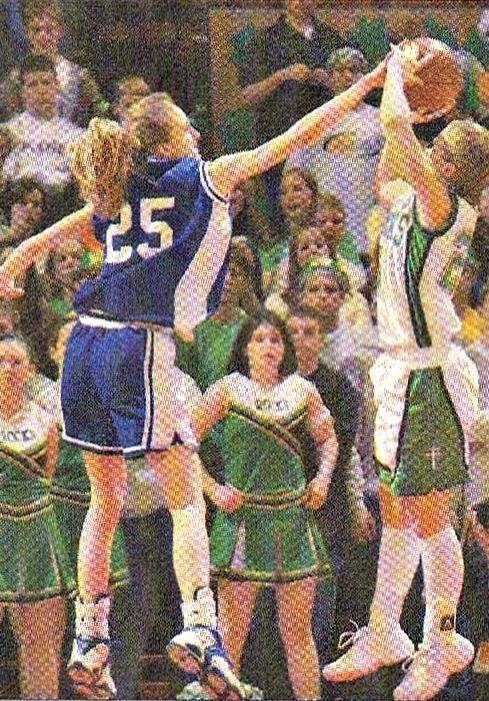 A Columbus Scotus player’s shot is being blocked by Megan Wilson of Lincoln Christian, the team that went on to win the Class C-1 title game in 2002. This is the one and only time that L.C.S. girls won the state championship so far. This was supposed to publish yesterday right after I completed it. Not sure why it did not. So, half of the teams have lost by now, but I think the post is still relevant enough. In just a bit I will post my personal Flashback Friday. Sorry for the technical difficulties. Moments ago, the first tip-off of the 2014 Nebraska Girls State Basketball Tournament just happened. I have so many memories of being involved with the state basketball tournament and plan on sharing a few with you tomorrow on a more personal Flashback Friday. For today, I want to simply celebrate those teams who are about to be put into the record books. Whether they win the tournament or lose during the first round, being skilled enough to play at state basketball is a big deal. Congratulations to each one of the teams participating! What is fun about this event is that the whole state is represented in the event. Here is a breakdown of all of the statewide regions and schools. Hopefully I did not miss any – it’s quite a list! Here is a link to a printable page if you want to keep up the bracket. Sorry that I did not think of posting anything like this for the fall sports or the previous winter ones. Of course, mapping every qualifying wrestler would take more time than I have. And I am pretty sure that most divers are from the Metro region since I would bet most smaller schools cannot exactly have their own school pools. But I have to admit that I notice this time of year more because I am a big basketball fan. I have been to many a tournament game as I will share tomorrow. By the way, both the Nebraska School Activities Association and the Lincoln Convention Visitor’s Bureau have been working hard to make sure that the tournament participants’ visits to Lincoln are pleasant ones. You will find construction postings as well as parking information, so you can attend any and all of the games. Plus additional events are listed that are happening around Lincoln in case you want to paint the town (in your team’s colors of course!) Go, teams! P.S. Did you guess when yesterday’s basketball picture was taken? 2002 is the correct year. Now can you guess the teams? More on that tomorrow.